The transmission in your vehicle is one of the most complicated components that your vehicle as to offer. 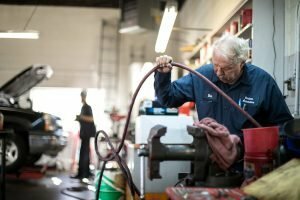 Transmission problems can be difficult to diagnose for some shops as they can cause drivability symptoms that are mimicked when other parts on your car, truck or SUV start to fail. One common symptom that points to a possible transmission issue is if your vehicle does not transition smoothly between gears. We know transmissions here at Hartman Automotive and we can quickly diagnose any problems you may be experiencing with your transmission. One preventative maintenance measure that your vehicle can use is a transmission flush depending on the age and condition of your transmission fluid. This is the fluid that helps lubricate and clean the gears in your transmission. New transmission fluid has a transparency to it which can tell you its condition. When it becomes contaminated or burnt it becomes far less effective and can start to harm your transmission. Let us know if you haven’t had your transmission fluid checked in a while and we can test it for you. From there we can even give you an idea of when you should expect to have a transmission fluid flush performed on your vehicle. Transmission maintenance is important because you can’t expect a car, truck or SUV with a damaged transmission to go very far. Let us help you keep your transmission operating at its peak level of performance, giving your vehicle the best chance to go for as long as you choose to own it. If there is a severe problem with your transmission it might be that replacing your transmission could be less expensive and more efficient when it comes to getting you back on the road in a vehicle that is both safe and reliable. Our technicians will provide you with all the information needed for you to make the best decision when it comes to your vehicle. So if you have questions about the best way to maintain or repair your transmission, give us a call here at Hartman Automotive. You can also stop by our garage or schedule an appointment online for a day and time that is most convenient for you!